This is an adorable and educational story about one dandelion’s flight to a new home and the happy family she finds. In The Runaway Dandelion, a beautiful meadow is bulldozed to make room for new construction. Harsh chemicals are brought in to kill all the dandelions in the new lawn, but one little dandelion survives. When her petals turn to white fluff she drifts a long way until she settles in a perfect new home and watches the daily life of the people who live there. I must applaud the author’s desire to bring such an important message to young people. Her passion is evident on each page. As sustainable lifestyles become more prevalent, books such as these will encourage children from an early age. The one challenge I have with the story line is that the dandelion appears to see every inch of the family’s farm from where she is planted in the ground and seems to know the kids aren’t watching TV because they are so busy working on the farm. It’s a little niggle, but it was there for me. The artwork by Leticia Plate is lovely. The colors and style are perfect for this story. The book has important terms appearing in green instead of in black, which are listed in a glossary at the end along with definitions. There is also a list of resources and useful links in the final pages. 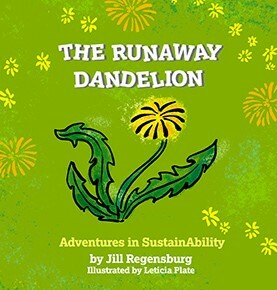 The Runaway Dandelion will open up the minds of young people and get them asking questions. Unknown to Dawn, her grandfather has shot an old swan out of mercy. In their coastal Alaskan town, her father buys the swan pelt, preventing her Uncle Alex, a fur trader, from selling it for export. Dawn’s father surprises her part-Aleut mother with a hat she helped to make and also with an idea to catch poachers. Shooting swans has become illegal but Alaska is a territory and Prohibition occupies the Sheriff. Dawn and her mother become involved with suspicious responses to the swan bonnet besides its haunting effect. 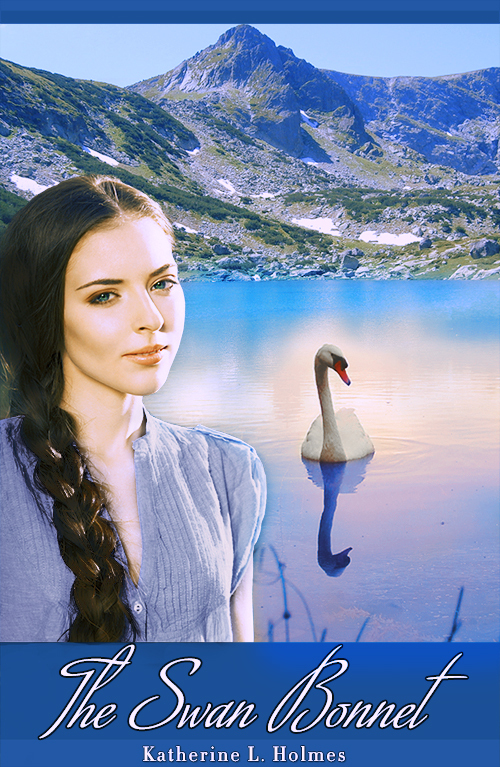 Because Dawn’s grandparents see the swans first, Dawn agrees to secretly watch the migration with the Deputy Sheriff’s son. But after she and her mother encounter women from a ship and find out about a hunting party, they ride to the inlet. There are also townspeople roving the shore but who is the vigilante and who is the poacher? We tend to absorb the history of our environment. As it was for many, Alaska was romantic to me as a frontier, romantic while living in the city. All of a sudden someone would leave Minneapolis for Alaska. My brother went there to do legal work after he had worked with Indian Legal Aid in Duluth. While he was on the south coast, I thought of moving. I read up on the state and became caught up in its history. The near extinction of swans in the United States had me thinking about settings, and soon I was planning a story. Learning about Alaska was like learning grammar through a foreign language. I’ve never read a history book about Minnesota, though I have Midwestern ancestry going back to the mid-1800s. Mining hopes in Alaska were very similar to those on Minnesota’s Iron Range in the early 20th century. The influx of people in Northern Minnesota had similarities to Alaska’s new population. Sometimes they were the same people. Like Alaska, the fur trade began Minnesota history. I’d heard much about the 1920s on the Iron Range from my mother. Boomtowns and sudden wealth mapped the region. I posted the book at Authonomy.com in 2009, while I began to re-work the historical detail. I was afraid the swan hat would seem far-fetched. But it wasn’t historically. The West established its own dress. I actually hadn’t seen Chaplin’s The Gold Rush and later, when I watched the VHS, the women’s fur hats were part of the entertainment. school years the pheasant pelts one of my brothers brought home after hunting. He hung the pheasant pelts on the wall of his room and then in the basement. These pelts fit neatly on the head so that, with my friends, I wore a pheasant hat – until my mother found out and scared us about lice. There is some kind of method to storytelling after all. Katherine L. Holmes’s first published novel, The House in Windward Leaves, was an E-book Fiction Finalist in the 2013 Next Generation Book Awards and also a Juvenile Fiction Finalist in the 2013 National Indie Excellence Book Awards. Her short story collection, Curiosity Killed the Sphinx and Other Stories, was published by Hollywood Books International. In 2013, The Wide Awake Loons was published by Silver Knight Publishing and The Swan Bonnet was published by Enigma Press. Katherine lives in Duluth, Minnesota, where besides writing, she works with used books. 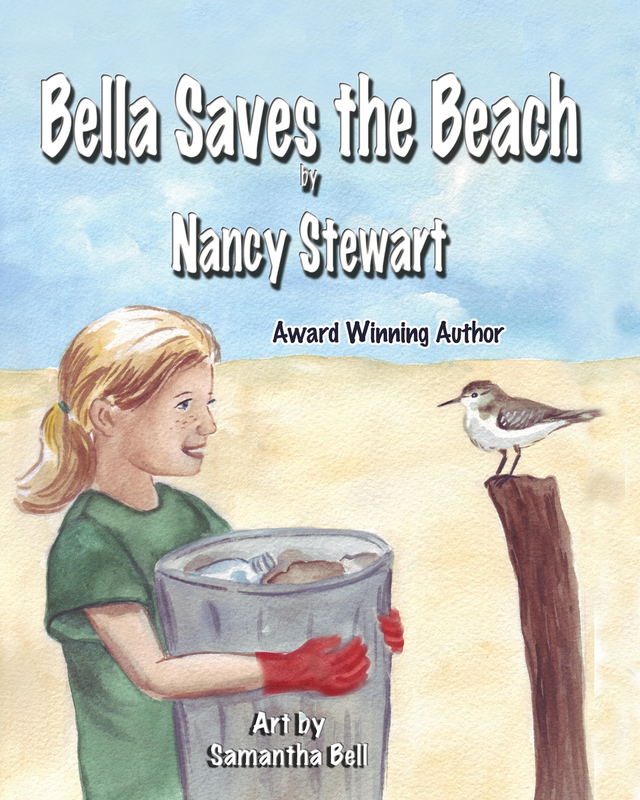 A true story of try and try again can be found in Bella Saves the Beach by award-winning children’s author, Nancy Stewart. Bella is sad when her beloved beach is loaded with trash. But with her best friend Britt away on vacation, it’s harder to clean up the beach than she planned. Each new idea doesn’t bring about the desired result, but Bella is determined to make the beach safe and clean for her animal friends. To someone who loves learning, a book like Bella Saves the Beach is so wonderful. This book has two messages. There’s the environmental one about how dangerous trash is to wildlife. Then there’s the “If at first you don’t succeed, try, try again” message. 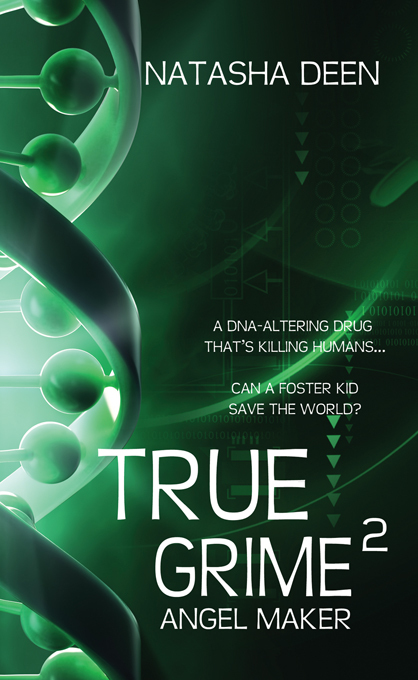 Combining them makes for a superbly told engaging story about one girl’s determination to make a difference. From the beginning, Stewart’s Bella and Britt series has shown young readers that their ideas matter and how they can make a difference when it comes to caring for our planet and its creatures. In this new book, the author takes that message to a new level by leaving Bella to face the challenge without her best friend Britt’s support. Now it isn’t two kids making a difference. It’s one determined young girl. At the end of the story, the author shares information on beach trash, facts about creatures mentioned within the book’s pages, and encourages readers to have a Green Picnic on the sand, leaving behind only footprints. One can’t forget to mention the stunning watercolor artwork of Samantha Bell. She has illustrated all three books in this series. With warm colors and rich details, she brings Bella’s story to life in pictures. A perfect complement to Stewart’s story, the artwork is so lovely you can almost hear the waves hitting the sand and the caws of the birds. 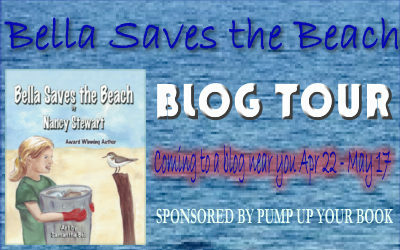 Bella Saves the Beach is a fine addition to the Bella and Britt series. I can’t wait to see what Bella and Britt are up to next. The author paid me to promote this book through a virtual book tour with Pump Up Your Book. This fee did not include a review. This review contains my honest opinions, for which I have not been compensated in any way. Bella and Britt are worried about all the trash appearing on their beautiful beach. But what can they do? Britt is leaving on vacation, and Bella can’t solve the problem alone. Without adults to lend a hand, can they possibly save their beach? Ah, yes, Earth Day. We think about it once a year. Celebrate it? Let’s not go overboard. After all, aren’t the governments of the world doing something about it—whatever it is? Earth Day, founded by Senator Gaylord Nelson, was first organized in 1970 to promote ecology and respect for life on the plane. It has come a long way from then with one hundred forty countries around the globe participating this year. And counting. Earth Day, very much like Earth Hour, has taken on a life of its own. Here is one of the most outstanding projects we should be talking about for Earth Day, 2013. It is The Canopy Project. Over the past three years, this project has planted over 1.5 million trees in 18 countries. In the US, projects to restore urban canopies have been completed in many large cities. In Haiti alone, where earthquakes caused landslides on deforested hillsides, leading to horrific devastation, Earth Day Network planted 500,000 trees. In three high-poverty districts in central Uganda, they planted 350,000 trees to provide local farmers with food, fuel, fencing, and soil stability. Climate change can seem like a remote problem for our leaders, but the fact is that it’s already impacting real people, animals, and beloved places. These Faces of Climate Change are multiplying every day. What can be done about it? Each of us, individually, can make a difference. When we all do our share, the entire world can begin to heal itself. I’ve pledged to not use plastic bags, to using cold water in the washing machine and to using earth friendly cleaning products. We’ve changed all light bulbs to save electricity, and they are turned off when leaving a room. I remind students when doing a book signing that turning off a light helps save a polar bear! But it’s more than these things, isn’t it? Helping save our planet is really a state of mind. It’s being in the flow of good ecology every day, even every minute. And soon, it’s a way of life. Living this state of mind will help save all our lives and the lives of those to come, our children and our grandchildren. What better ongoing gift can we give to anyone than a sustainable, green and whole planet? Oh, and it’s not, of course, just April 22. It’s every day, every minute for the rest of our lives. 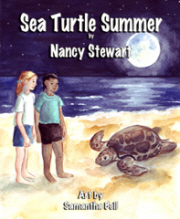 Nancy is the bestselling and award winning author of the four Bella and Britt Series books for children: One Pelican at a Time (eighteen weeks on Amazon Bestselling List), Sea Turtle Summer, (which won the Children’s Literary Classic Gold Award), Bella Saves the Beach (which won the Gold) and Mystery at Manatee Key. The authorized biography, Katrina and Winter: Partners in Courage, is the story of Katrina Simpkins and Winter, the dolphin. One Pelican at a Time and Nancy were featured in the PBS Tampa special, GulfWatch. All are published by Guardian Angel Publishing. 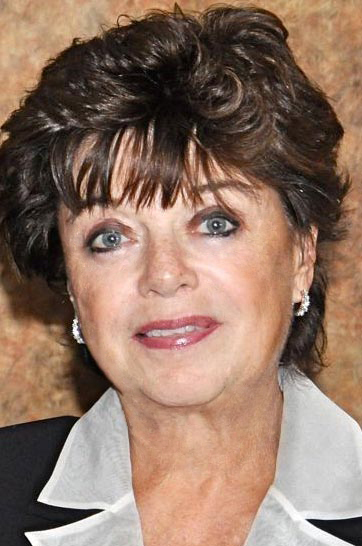 Nancy is a frequent speaker and presenter at writer’s conferences throughout the United States. She conducts workshops and seminars and speaks to school children on writing and helping save their planet. A blogger with a worldwide audience, she writes of all things pertaining to children’s literature. Nancy’s travels take her extensively throughout the world, most particularly Africa. She is US chair of a charity in Lamu, Kenya, that places girls in intermediate schools to allow them to further their education. She and her husband live in Tampa and St. Louis. Dr. Seuss’ The Lorax in Theaters Now! 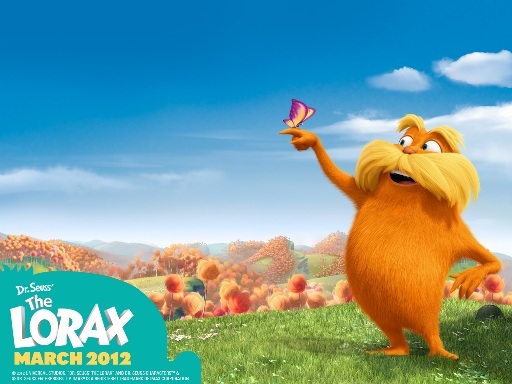 Dr. Seuss’ The Lorax took the top spot at the box office this weekend. I’m not surprised. Not only was it released close to the beloved author’s birthday, but many schools–especially around here since Theodore Geisel grew up about ten minutes from where we live–read The Lorax during their Dr. Seuss day celebrations. With the voice talents of Danny DeVito, Ed Helms, Zac Efron, Taylor Swift and Betty White, to name a few, I have a feeling audiences will be busting a gut if they go see this movie. You can check out the trailer and other free downloads at www.theloraxmovie.com. Do you and your family plan to see the movie or have you already been? Feel free to share your thoughts.